A dog team prepares to head out Sunday in the search for Serenity Dennard. ROCKERVILLE, S.D. 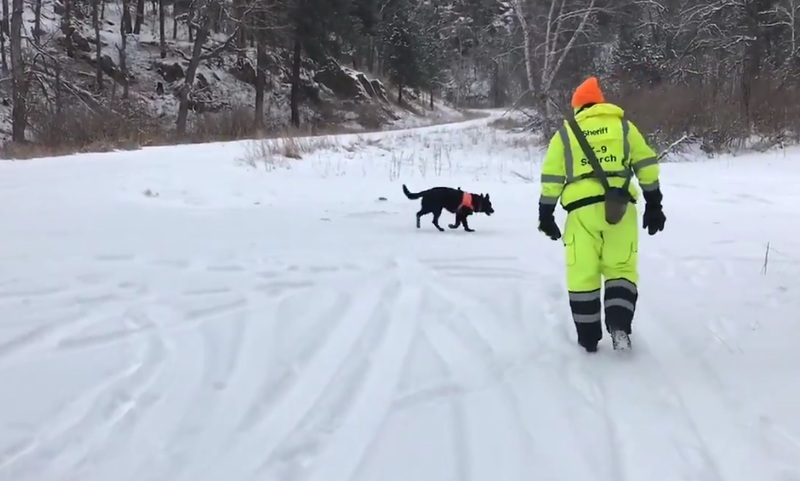 - Low clouds and fog delayed the search by helicopter for 9-year-old Serenity Dennard; but the dogs and ground crews were right back at it despite the harsh weather conditions Sunday. Today marked exactly one week since Serenity darted away from the Black Hills Children's Home near Rockerville. Searchers have been looking for her since Sunday afternoon, battling extreme cold, snow and wind. Pennington County Chief Deputy Sheriff Willie Whelchel says "we've got a large crew up in the woods today. We're right on time in getting started. We've got overcast and light snow. Still really cold. We're hoping to get a little break in the weather with some sunshine and that may allow our helicopter to get back up." Whelchel says he's hoping to get the copter back up, because they have some particular areas they'd like to have them fly over. He says they're goal has not changed -- bring Serenity home today. Seven dog teams from around the five-state area are back on the trail today. They will work with their handlers in shifts -- coming back to base camp to warm up and regroup. The Gaslight Restaurant in Rockerville was helping the effort by making lunch for the search crews.